Heather Mansfield presents webinars on how nonprofits can successfully use Facebook, Twitter, LinkedIn, YouTube, Flickr, Pinterest, Google+ and mobile communications. Her webinars focus on practical how-t0 advice and demonstrate in real time, click-by-click the best practices that Heather has learned from spending more than 20,000 hours on social media sites over the last eight years. As a firm believer in putting your money where your mouse is, Heather also donates 10% of the gross proceeds from her webinars to her favorite nonprofits. To learn more about Heather’s webinars, including upcoming dates, topics, and registration information, please see the current Webinar Schedule. I recently did a webinar for GuideStar about how nonprofits can successfully utilize YouTube. After the webinar GuideStar asked the attendees “Do you have any comments or feedback regarding today’s webinar?” Below are the answers – 100% uncensored! 1. The presenter was exceptionally well informed and passionate. Outstanding presentation! very good. A lot of info covered in a short period of time. 3. It was great! Very clear and helpful. 5. The volume seemed really low. 8. Very pleased and all smiles!!! Thank you Guide Star for offering this! 9. Thanks — absolutely terrific. The most valuable hour of my week! 10. Thank you for providing this service to the nonprofit sector. 13. I disagree about using interns and college students and the generalization that they will work hard. Our experience has proven otherwise, its been a nightmare to say the least. 14. This was the BEST webinar I’ve ever viewed. Thank you for choosing a timely topic and an excellent speaker. 15. Today’s webinar was both informative and motivational. Thanks, GuideStar! 16. My first webinar. Very well done. Thanks. 17. TERRIFIC – HEATHER WAS EXTREMELY WELL SPOKEN AND UNDERSTANDABLE FOR THE NEW USERS OF SOCIAL MEDIA. THANKS. WAS REALLY GREAT! 18. Very helpful. Thank you! 20. Really enjoyed this. Lots of good information. Thank you. 22. Every organization should hear this presentation. 23. An excellent presentation. Lots of good information and she was thinking about the future. 25. I enjoyed the information very much. 27. Heather did a fantastic job of explaining things and avoided the jargon of techies. Very down to earth, usable information/applications. Highly pleased with this webinar. Will do this again! 28. Excellent! Thank you for providing this event! 29. Many of us in the nonprofit world are older and not up on technology. 30. I’ve never texted. Too much texting seems frivolous and indulgent. 31. Sound went in and out at times. Didn’t catch last question, just answer. 32. Good presentation – however, the sound faded in and out during the q&a. Excellent information. Exactly what I was looking for to expand our Foundation’s reach into the community and hopefully help us to develop a skill set that we can use to help other nonprofits. 34. It moved a little too quickly for my expertise. You did an outstanding job — clear, concise, easy for non-techies to understand! I would be honored if you would agree to another webinar in 2010 on Web 3.0. I think that there is a good synergy between your work and GuideStar. It was an excellent presentation. Is it being archived? I would like to see it again and bring in a few of my collegues that couldnt make it. Thanks! 1. You have to get in at the beginning of some of these vendors and test out different vendors to see what will work for you and your organization. You don’t have to spend thousands of dollars to get your word out. 2. What all the differences among things were and which of those to do first. 6. Website addresses that were suggested. 8. We were recently talking about mobile apps, so this was very informative. The texting info was great too. 9. We need to incorporate RSS into our site asap so that we can use the inexpensive mobile site creator Ms Mansfield suggested. 10. We need to have a mobile website set up. This is a great way to engage new individuals who would be interested, but haven’t yet heard of our organization. 11. We need to create a mobile Website. 14. We need a mobile website! 16. We first need to get our Newsletter in an email format, and we need to get a website! 20. Understanding the uses of mobile technology. 21. To have a mobile website in place before launching a text to give campaign. I didn’t get a chance to say so in the event, but Heather should check out xipwire as a text-to-give option. They are are giving nonprofits the service for free for 1 year! 22. To create a mobile website in addition to the regular website. 23. To become invloved in social media. 24. Timeliness of early adoption of keywords. 35. There are many pieces to the puzzle. You need to define a starting point. 36. There are few proven best practices with mobile technology. 38. The various options available and price of those services. 39. The value of first adoption in new technology. 42. The statistics associated with “bit.ly”. 44. The resources that I could check into further. 45. The resources and links provided. 46. The recommendations – both for best practices and companies we can investigate for mobile campaigns. 47. “The realization that if you went with an app for your Non for proit, you would have to do three of them. 49. The process of setting up a mobile campaign, as well as the various websites to utilize. 50. The order of things to accomplish to launch a mobile marketing campaign. 51. The order of Mobile Marketing. 52. The need to think about how mobile devise users are viewing our communications (i.e. links to our website). 53. The need to have a mobile site. 55. The need for a mobile website and a mobile presence. 56. The most valuable info given to me was the information about the websites to help in advancing to mobile technology. 57. The links to additional information, the practical advice, best practices. 59. The information on the .mobi site – something we are considering. 60. The information on Text campaigns and Mobisite Galore. 61. The information about the Web sites that can be used for text message campaigns. 63. The importance of having a mobile website or webpage for donating to a nonprofit using smartphone. Also it was a good tutorial on how to set up mobile website and tips on what company(ies) to use. 65. The idea of building a mobile website had not even occurred to me. 66. The history and outlook of this type of giving. 67. The entire seminar was valuable. 68. The cost effective resources that are available to nonprofits, big and small. 69. That we should be focusing on creating a blog and a mobile site next. 72. That the benefit of early adopting must be weighed against the cost. 73. That once we get a blog going, we can create a mobile website with little financial investment. 74. That many people access the web using their mobiles, so getting into this territory is important. 75. That I have no clue what I’m doing. Oh, wait, I already knew that. Ha. 76. That I can turn my blog into our mobile site. 81. Stats, resources and her recommendations! 82. Statistics on mobile usage. 83. Statistics and resources presented. 84. Starting a mobile website before pursuing other avenues. 85. Start gathering phone numbers for future mobile campaigns. 88. Setting up a mobile site. 90. Service providers names and contact information. 92. Realizing how behind the times we are. 95. Places to gather more information. 96. Phenomenal presentation. The consideration of trends to watch before investing is very valuable. 97. Overall understand of what mobile marketing is and potential strategies. 98. Our organization should add a mobile web site and how we should do that. 100. One of the most useful info was about converting our web into mobile website. 104. New and exciting avenue for advocacy, education, and fundraising. 114. Mobile web and text alerts before text to give. 115. Mobile text giving should be preceded by other foundation actions. 117. Mobile info and trends, tool, sites. 118. Many different tools and stats. Saves me much research in preparing and presenting a plan. Also much of this is much easier than I suspected. 125. Learning about mobile websites. 127. Keys to launching a text-to-give campaign. MUST have an appropriately designed and 128. Managed mobile website that plays well on a small screen with active changes in content and supported by a text-alert campaign. Know user demographics. 133. Info on launching a text campaign. 134. Info about mobile web sites–didn’t know there was such a thing! 135. Inexpensive cost of setting up and maintaining mobile site. Was told by web company that it would be about $8,000. 140. Importance of a mobile website. 141. I was not sure how text giving campaigns work, and the technical knowledge now makes it seem like something we can implement. Before, it did not seem like a possibility. 142. I never realized how valuable mobile technology really is! Best tidbit: We should think of newsletters as the same as Text Message for mobile websites. 143. I need to become better versed in mobil marketing. Most of the terms, etc. were over my head so I spent much of the call wondering how you do what she was talking about. 144. I just want to suggest using a different webinar tool or encouraging the presenters to slow down when changing screens. At many points what she was talking about did not sync up with what we were seeing. Otherwise, excellent webinar. 146. I could not get the audio to connect – apparently,my computer needs additional software. 147. I am a complete novice. Heather’s presentation was amazing – it flowed so well together. I was excited to see the resources and very glad to see that it was targeted to nonprofits with minimal budgets!! 148. I am a complete novice. Heather’s presentation was amazing – it flowed so well together. I was excited to see the resources and very glad to see that it was targeted to nonprofits with minimal budgets!! 149. How to start using mobile media to raise money. 150. How to start and then plan for the future. 152. How to engage our supporters, by telling our story on social media sites. 153. How to do fund-raising using mobile phones via texting. 157. How and why to set up mobile version of our website. Content ideas for text messaging. 160. Getting an easy to view mobile website. Also getting a texting campaign linked from mobile websites. 161. Get the mobile list first. 162. Exploring the resources available. 163. Everything, but the test to donate part since it is too expensive for us. 167. Different ways you can reach donors. 169. Creating the mobi website and information on the various organizations out there providing services to the nonprofit world. 174. Build mobile website presence first and to begin building mobile database list now. These things were not considered in the organization’s conversations about mobile marketing. 179. Apps for Droid, Blackberry, iPhone, etc. 180. 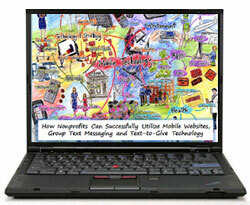 All the different resources out there for organizations that want to use mobile technology. Recently attended your webinar- Grrreat! Thanks! And would like to attend more, but the times are a little challenging. Do you record them? Is there a way to watch them at my own convenience?? No sorry. I don’t record my webinars. It’s too expensive to make them password protected. Thanks. Heather, if you can secure files on your website, there may be a way to record your webinars much cheaper than $500 — at least for the software. Let’s chat via private message.